A bathroom remodeling is an impressive task. But before selecting the tile or bathtub design, there are some less inspiring points to remember so your plan turns out just the way you dream it. Because refurbishing a bathroom can be upsetting, time-consuming and expensive, we prepared a simple 31-point checklist to make sure that your design stays on track, and the renovation flows smoothly. The bathroom entrance door swings so that it does not interfere with people in front of fixtures. Fixtures located so that more than two people can use the space comfortably. Water closet and bidet in separate compartments or shielded from entrance view. 15″ (38 cm) or more of clearance space from the centerline of lavatory bowl to a wall or similar obstruction. 30″ (76 cm) or more of clearance space between the centerlines of double-bowl lavatories. At least 30″ x 48″ (76 cm x 122 cm) of clear floor space in front of the lavatory. 16″ (41 cm) from the centerline of a water closet or bidet to a wall or similar obstruction, or fixture adjacent to it. At least 48″ x 48″ (122 cm x 122 cm) of clear floor space in front of the water closet or bidet. Tub size large enough to comfortably use (at least 5′). At least 60″ x 30″ (152 cm x 76 cm) of clear floor space in front of shower/tub. Non-slip flooring used throughout the space. Ground-fault circuit interrupter electrical receptacles used. Electrical switches placed away from tub or shower. Grab-bars at shower/tub entrance and inside enclosure. Tub and/or shower easy to enter and exit. No steps at the tub or shower. Safety glazing on glass used for shower doors. Shower door swings into bathroom, not into shower enclosure. Bench/seat included in shower enclosure. Pressure balanced water control valves used in shower. Temperature regulating water control valves used in shower. Adequate counter or shelf space around lavatory. Adequate storage for grooming equipment, toiletries, linens, etc., 15″ – 48″ (38 cm – 122 cm) above the floor. Towel bars /rings located within reach of fixtures. Bathroom linen and paper product storage space provided. Storage space for shampoo and such in the shower/tub area, between 15″ to 48″ (38 cm – 122 cm) above the floor. An efficient ventilation system is part of the plan. 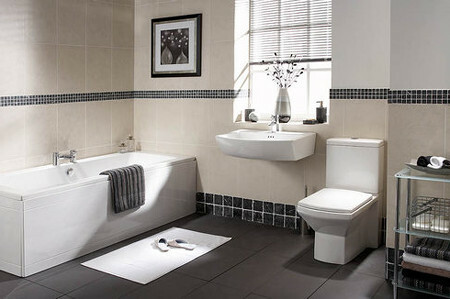 Bathroom heating system will keep the space comfortably warm. Task lighting provided at every functional area. General lighting provided throughout the bathroom.